Arrow Films have announced two new DVD releases from the Arrow Video and ArrowDrome labels. A new digitally re-mastered version of The Deadly Spawn will be released on to Arrow Video on 19th March, featuring an exciting line-up of special features including an alternate opening sequence and selected archive TV interviews with the filmmakers. Following this release will be the arrival of Don't Go in the House on the ArrowDrome label, which will be released totally uncut for the first time in the UK on 26th March. Something awful is coming, hurtling through the void in a meteor that's on a collision course with Earth. What terrifying entry in the annals of horror will be unleashed when the sinister intergalactic payload smashes into our planet? Answer? The Deadly Spawn! 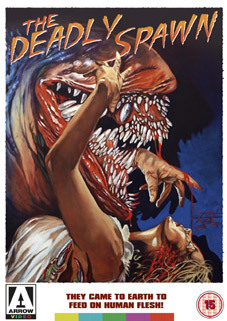 The Deadly Spawn will be released on UK DVD by Arrow Video on 19th March 2012 at the RRP of £15.99. In a steel room built for revenge, they die burning... in chains. Most horror killers like to slash and slice their victims but little Donny prefers setting them alight in Don't Go in the House, a sleazy reminder of just how shocking horror movies could get in the video nasty era. Now see Don't Go In The House – complete and uncut – and revel in the surreal sleaze, low rent Hitchcock melodrama, off Broadway acting and extreme, heat-seared violence of an independent horror classic that still retains its ability drop jaws, rattle cages and offend sensibilities over 30 years later. 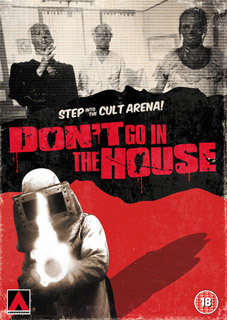 Don't Go in the House will be released on UK DVD as part of the ArrowDrome label on 26th March 2012 at the RRP of £9.99.